Step into luxury at this spectacular oasis set just steps to a scenic stretch of beach in the prestigious community of Puerto Los Cabos. Aptly named, Villa Tranquiliad surrounds you with an atmosphere of refined relaxation, offering a host of top-of-the-line amenities to complement the gorgeous Sea of Cortez vistas and the soothing sound of the waves. Gracefully appointed and lovingly decorated, this magnificent villa boasts a spacious interior with lavish bedroom suites, wood-beamed ceilings, Travertine and granite counters, and an expansive living area opening to an unbelievably scenic terrace. 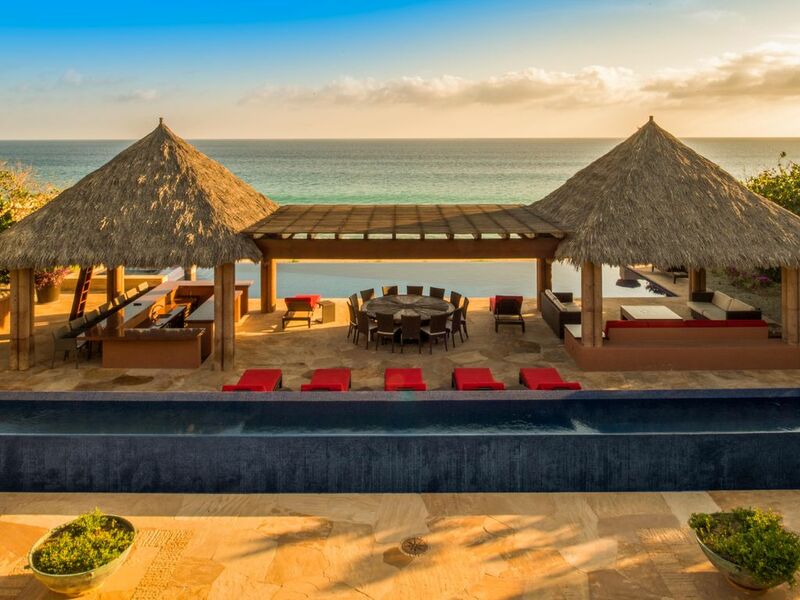 Step outside, and you’re greeted with palapa-shaded patios, an inviting outdoor dining area, an oceanfront swimming pool, a large Jacuzzi, outdoor entertainment system and so much more. Ready to see the sights? This wonderful vacation villa is just a short drive to the historic heart of San Jose del Cabo, offering gourmet dining, art galleries and quaint boutiques. World class golf if but minutes away. Whether you’re planning a once-in-a-lifetime celebration or a family vacation to rival all others, Villa la Tranquilidad sets the scene for romance, relaxation and recreation. When you book this villa with us, you’ll get $900 Value in FREE Extras, Complimentary beer and water (24 ea), 1 hour butler/bartender service upon arrival, FREE bottle of premium tequila, 1 Complimentary Arrival Transfer (10 people max, ask us for details), Choice of $400 Cabo Expeditions credit good toward activities OR 1 FREE return transfer (10 people max, ask us for details), FREE chips, salsa fresca, guacamole and margaritas on arrival, FREE villa delivery of your AVIS car rental, FREE airport and villa arrival services, FREE 24/7 customer service, A dedicated local concierge during your stay, Best Price Guarantee! Some restrictions apply. Ask us for full details. Our team represents this vacation property. Our destination experts have been arranging vacations to Cabo for over 25 years offering outstanding customer service and in-depth local expertise. Whether you need tips on the best local activities or great restaurant recommendations in Los Cabos, we're here to help. We look forward to helping you plan an amazing vacation in Los Cabos. Home theater room with electric recliner seating for 12 (103' screen). 11 TVs w/Satellite television (8-40', 2-46', 1-60'). Patio dining. 10 Lounge chairs. Fire pit. Shade structure. Outdoor Stereo & TV.